"Ed Stelmach's" letter (shown below) is a prime example of government obfuscation and deliberately missing the point. There won't be any help coming from those quarters any time soon. The best and only practical way to put an end to that sort of thing is to vote for another party in the next elections. Consider that politicians are opportunists. They come into a system that is dominated and controlled by bureaucrats. The bureaucracy has the real power, while the politicians have virtually none unless they purge the bureaucracy. After all. as far as the government bureaucracy is concerned, it has the real power, and politicians are just transients. Promises of whatever nature by politicians mean nothing unless the bureaucracy permits the politicians to do what politicians wish to do, or unless the politicians begin to control the bureaucracy. 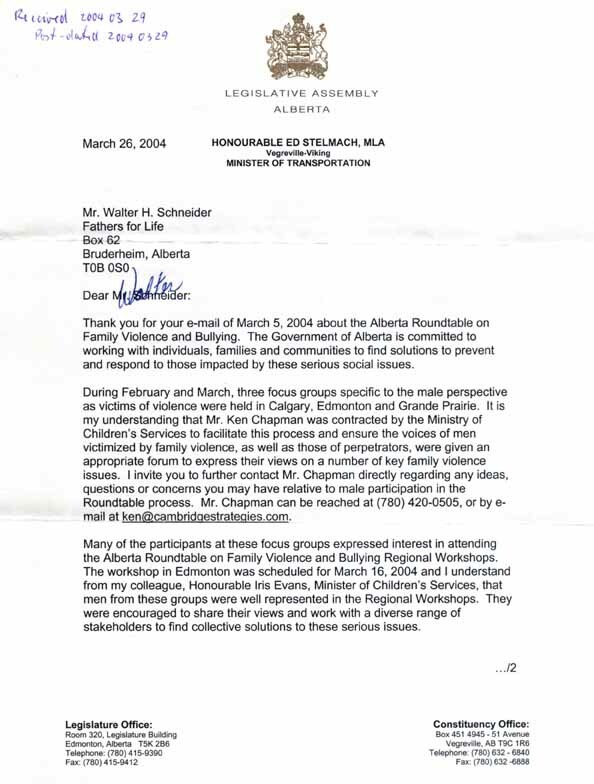 Thank you for your e-mail of March 5, 2004 about the Alberta Roundtable on Family Violence and Bullying. The Government of Alberta is committed to working with individuals, families and communities to find solutions to prevent and respond to those impacted by these serious social issues. During February and March, three focus groups specific to the male perspective as victims of violence were held in Calgary, Edmonton and Grande Prairie. It is my understanding that Mr. Ken Chapman was contracted by the Ministry of Children's Services to facilitate this process and ensure the voices of men victimized by family violence, as well as those of perpetrators, were given an appropriate forum to express their views on a number of key family violence issues. I invite you to further contact Mr. Chapman directly regarding any ideas, questions or concerns you may have relative to male participation in the Roundtable process. Mr. Chapman can be reached at (780) 420-0505, or by e-mail at ken@cambridgestrategies.com. Many of the participants at these focus groups expressed interest in attending the Alberta Roundtable on Family Violence and Bullying Regional Workshops. The workshop in Edmonton was scheduled for March 16, 2004 and I understand from my colleague, Honourable Iris Evans, Minister of Children's Services, that men from these groups were well represented in the Regional Workshops. They were encouraged to share their views and work with a diverse range of stakeholders to find collective solutions to these serious issues.